Last month I travelled to Edinburgh for the annual Edinburgh Yarn Festival. Edinburgh Yarn Festival has been running for a few years, and is one of the highlights of my knitting calendar. So what did I get up to while I was there? The day started early - I live in Durham, which is an easy day trip by train from Edinburgh, but to get there for doors opening at 10 am still required a rather early start! The weather was a bit of a surprise, with bitter wind and a little snow, and the day didn't have the best start with the ticket machine in the car park being out of order and the only other option being an automated phone line that refused to understand my accent through the howling gale! I did manage to get the car parked in the end though, and just had time to collect my tickets (and grab a coffee to warm my hands on) before catching the train. One of the lovely things about travelling to a yarn festival by train is spotting fellow knitters - the people in the seats next to mine were both knitting, and from their conversation I could tell they were definitely on their way to the festival. When we reached Newcastle the seat next to mine also became occupied, by a lovely knitter who lives somewhat locally to me, and we had several friends in common (six degrees of separation is definitely reduced within the knitting world!). We chatted the whole way to Edinburgh, admiring each others projects and yarn, which made the journey go super-quickly. Having been to Edinburgh Yarn Festival twice before, I knew the bus route, so hopped onto the bus and watched as it filled with fellow knitters along the way (you could mostly tell by the assortment of hand-knitted hats!). I had managed to pick up an advance ticket, which avoided a lot of the queueing; I think the staff let ticket holders in a few minutes early to save us all freezing! Getting in early really helps with browsing without the crowds, so I made sure to start by having a look round the whole of the marketplace. There were so many beautiful things on sale, lots of wonderful hand-dyed yarns from companies I was familiar with, and many that I wasn't. The festival is very much geared towards smaller producers rather than larger companies, and it was lovely to be able to chat to the stall holders before the room got too busy. Rather than wander aimlessly round the marketplace (which is a sure-fire way for me to blow my budget), I had deliberately picked up a couple of skeins from home that I wanted to buy a third skein to go with so that I can knit them into a Doodler. With this in mind, I wandered round the marketplace hunting for the perfect third skein, taking photos of all sorts of combinations to bear in mind for later. Once I had looked at most of the stalls in the marketplace, I wandered up to the podcast lounge, where I caught up with lots of people I had met before, and met lots of new people that I chatted to as well. The podcast lounge was much less crowded than in previous years as the organisers had added an extra marquee to the back of the venue to allow seating for an extra 500 people. It really changed the dynamic of the whole event, and for the better as there was a lot more space to just sit and chat and knit, which is what knitters do best! I decided that it would be sensible to pop out to get some lunch, for a bit of fresh air if nothing else, and handily the venue is right next to a large supermarket, so I braved the freezing conditions (yes, it was still snowing!) to take a quick walk out of the venue and clear my head. Once I'd had lunch I returned to the festival feeling refreshed, and embarked on more chatting and yarn browsing. I finally found the perfect third skein for my collection - a skein from Undercover Otter via the Stephen and Penelope stand. Stephen West was there, and I was wearing my Dotted Rays shawl but I was far too shy to go and say hello! ...and here it is with its friends! While I had been browsing the festival there was one colourway I kept being drawn to: a vibrant mint green with dark purple speckles. 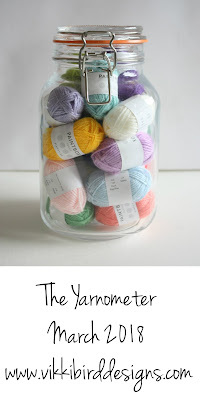 A lot of dyers had variations on the yarn and every one of them was beautiful. For some reason the yarn seemed familiar to me, but I couldn't work out why. After another period of sitting and chatting I realised that I already had a skein of something very, very similar at home! My favourite skeins had a lot in common with this one! As the festival was drawing towards its close, I had one final browse of the marketplace. It was really starting to wind down as people were heading off, which allowed much more space to browse. I had looked at the Martin's Lab stall earlier in the day, but it was too crowded to see everything, and when I went back at the end I saw a beautiful cowl made from mini skeins, which I knew I would love to knit and wear. Martin's Lab had both the yarn and the pattern (Soul Warmer by Lete's Knits), so I bought both and am hoping to knit the cowl as my advent project this year. My other purchase on my final look round the marketplace was a skein from The Wool Kitchen that I had eyed every time I walked past it. I have no idea what this skein will become but the colours are perfect and vibrant and so, so beautiful. I might just keep it for a bit to admire. By this stage I was pretty tired, but still had a couple of hours before my train was due to leave, so I headed to a coffee shop (within a book shop) to have a sit down and rest my feet. After the busy-ness of the festival, the rest was very welcome! I dozed for most of the train journey home. The weather was still bad and I was grateful that the trains were still running. There were no excited knitters on this train - I suspect a lot of us were dozing! Were you at Edinburgh Yarn Festival? What was your favourite bit? What did you buy? 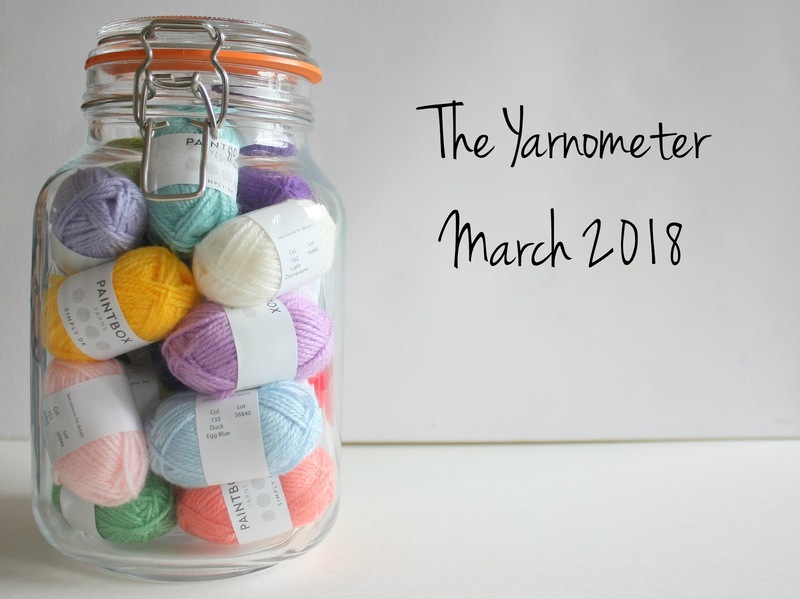 I have precisely no idea how we are already a quarter of the way through 2018, but somehow it's already time for my monthly look at the ins and outs of my stash. A rather cute cuddly toy for my daughter, I really enjoyed knitting this, and you can read all about it here. A special request from my brother, and one I was glad to knit, even if it was a bit of a pain at times. A full blog post about it is up now. One I can't share with you at the minute (which is a pity as it's super cute), but I'll be sure to show it to you later in the year. 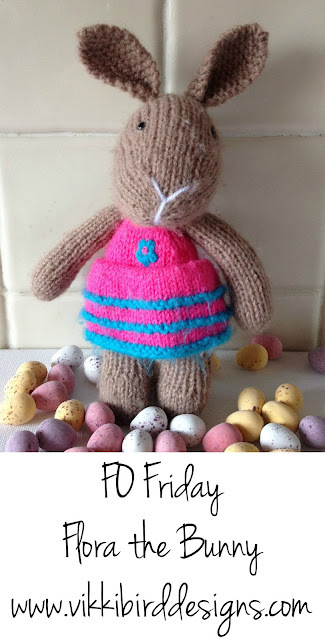 Over the Easter break I released a brand new pattern, and today I've finally found five minutes to tell you all about it! Several years ago I released my Fluffy White Clouds baby blanket knitting pattern, and since then it's been my best-selling pattern. Not wanting crocheters to be left out, my latest pattern is Fluffy White Clouds – the crochet version. The blanket is perfect for spring, and in the traditional colours of sky blue and cream make a beautiful unisex blanket, or you can change the colours to match a nursery or the preferences of the people you're making the blanket for. One of my testers, Jo, made a fantastic high contrast version in cream and black. 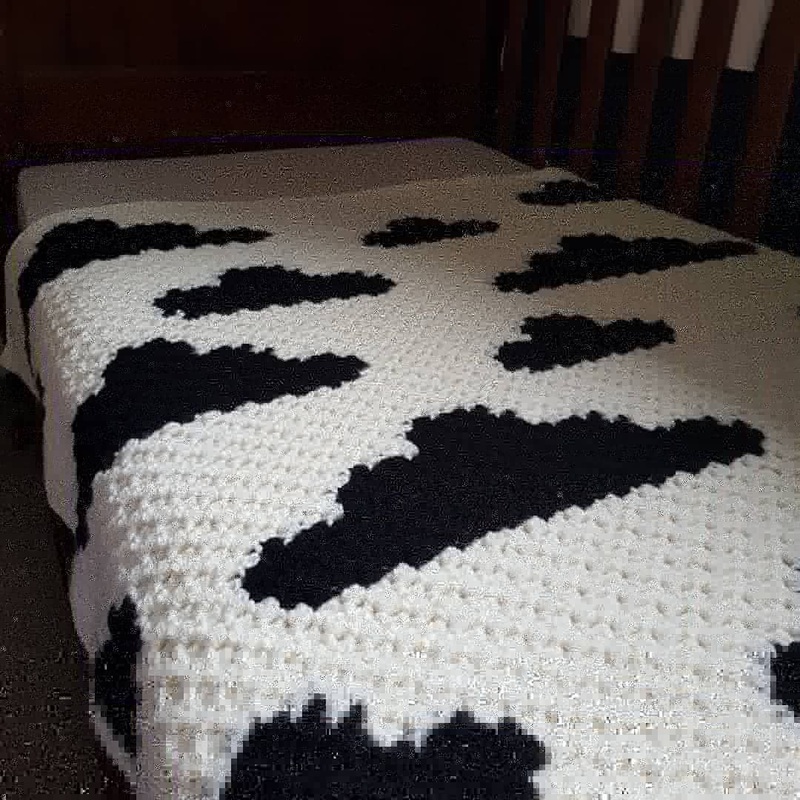 Fluffy White Clouds – the crochet version is made using the mini corner to corner technique. The pattern includes a full colour chart, as well as written instructions for the colour changes. In addition, the pattern features a photo tutorial on the technique, making the project suitable for ambitious beginners. The sample is crocheted in Paintbox Yarns Simply Aran,* a machine-washable, easy-care yarn that is perfect for babies. 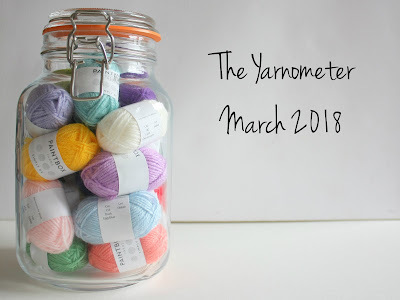 The yarn comes in 64 colours, so you'll have plenty of options! **No code needed – just add the pattern to your Ravelry basket and the discount will be added automatically when you check out. 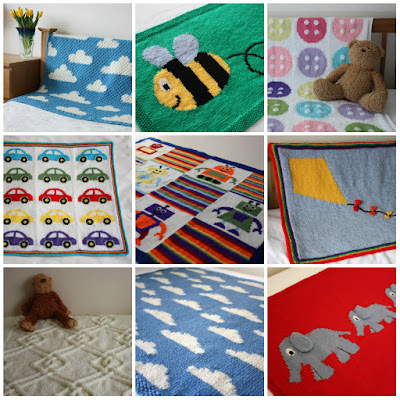 The pattern is also included in my ongoing 3 for 4 pattern offer – just add four single patterns to your basket and the cheapest will be free when you check out. Only one offer can be applied per basket. 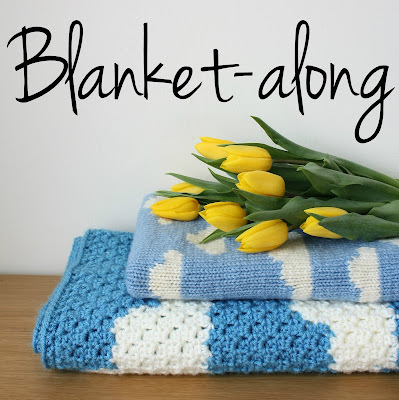 ***Working on a different blanket? Everyone is welcome to join in the Blanket Along! And don't worry if you're not going to finish by the end of the Blanket Along, I will be drawing winners from both the chatter and finished object threads.